My DNA Results Are Wrong. What Can I Do? 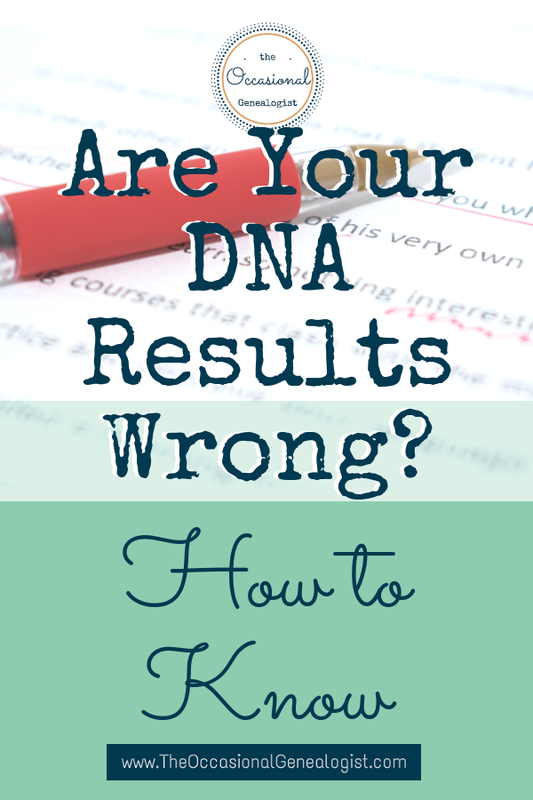 Have you gotten back your DNA test results and gone, "these are wrong!" but didn't know what you could do (or assumed you needed to pay for another test)? I am all for people taking multiple DNA tests for genealogy, but usually when you do it because you believe your results are wrong, you're throwing away money. Let me help you save some money or spend it wisely and figure out what you need to do. 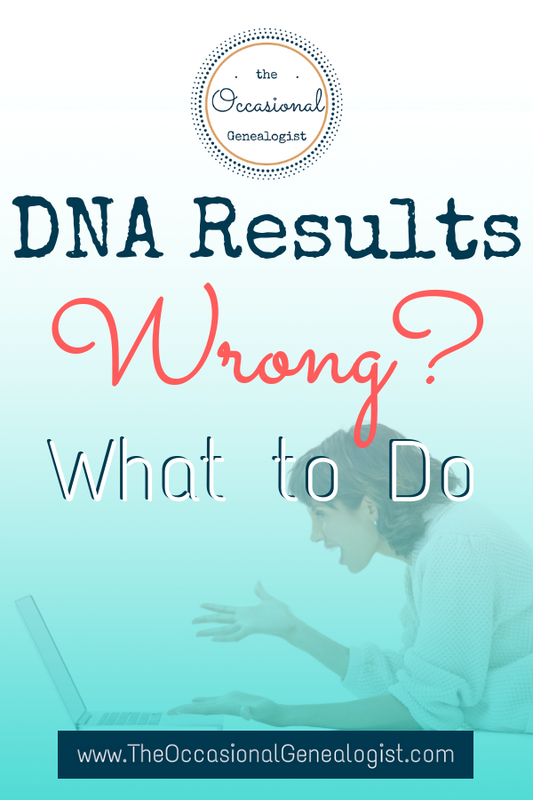 What to Do If You Think Your DNA Results are Wrong. First, your results are most likely not "wrong" you probably expected something different than you got and need to identify a solution other than taking the same test again. DNA is complex. T.V. commercials make it seem pretty easy and straightforward but it's not. 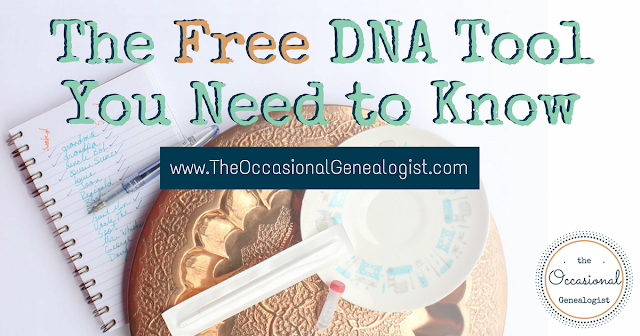 Understanding your DNA results is not rocket science, either (understanding everything about DNA is pretty close, but you don't need that level of understanding to do basic genetic genealogy). So the best place to start to resolve your issue with your results is this, you need to accept that your results are most likely not wrong, but there is something you don't understand. If you are unwilling to start there, you can stop reading, now. I can't help you if the only option you'll consider is that your results are wrong. In that case, go ahead and take the same test again, and again, and again, every time you get the same results. If you've made it this far, I'm assuming you've accepted the fact that perhaps you aren't the world's greatest expert in genetic genealogy. Neither am I, welcome to the club. Let's figure out what could be wrong with your results/understanding of your results. To do that, we need to look at the different aspects you might say are "wrong." The advantage of doing this is, if there is something wrong with your results, it will help identify that, too. Let me take care of some quick housekeeping, just in case you're reading the wrong post or need another post. This post is only going to focus on autosomal DNA results. That is a DNA test for genealogy. I'm not talking about paternity tests, DNA testing related to law-enforcement, or other non-genealogy types of tests. I'm also not talking about the other types of genealogy DNA tests which currently are Y-DNA and mtDNA. Autosomal DNA is the type of test you take at AncestryDNA, MyHeritageDNA, 23andMe, and the "Family Finder" test from FamilyTreeDNA (FTDNA---they sell Y-DNA and mtDNA tests, too, so don't get confused if you've taken different types of tests from them). 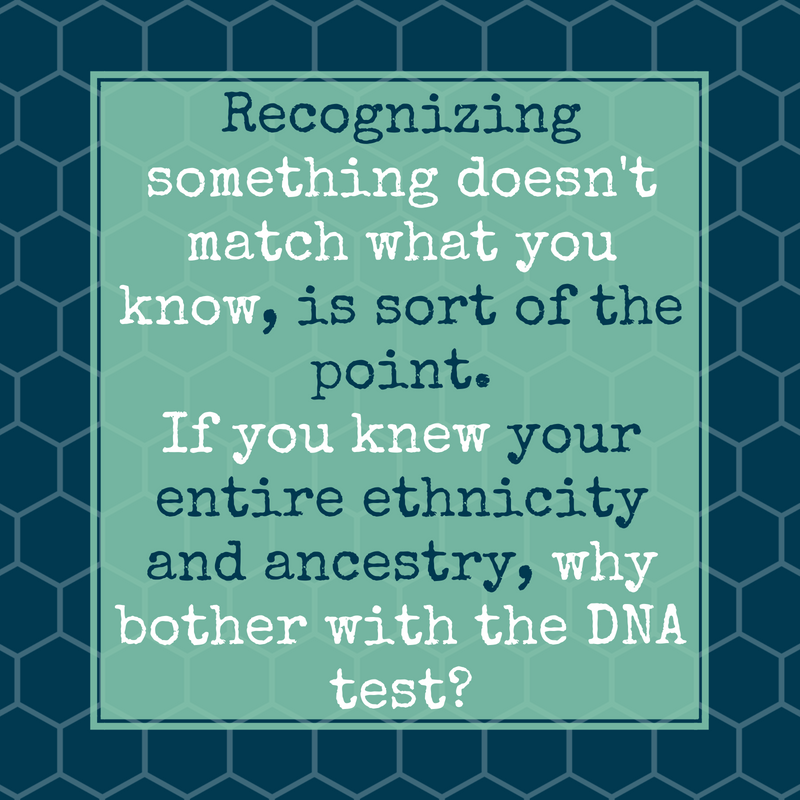 Some of this advice applies to any genealogy DNA test but some only relates to autosomal DNA. Also, some of this advice doesn't apply if you tested at some other company. I'm going to hit those areas first because they are the "umbrella" issues. They cover a lot. DNA tests (of any type) from the companies I just listed are rarely "wrong." That means the company rarely has something go wrong in the lab or mixes up your results with someone else's between you returning your sample and giving you your results. It can happen but it is extremely rare, you should consider every other possibility, first, it's so rare. 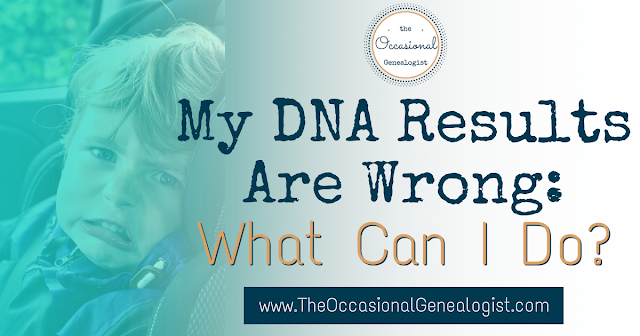 Determining if a Y-DNA or mtDNA test is wrong, or what is actually the issue, is different than for autosomal DNA which is why I'm not discussing all of them in this one post. This is still The Occasional Genealogist so I'm assuming you don't want to be reading for hours! 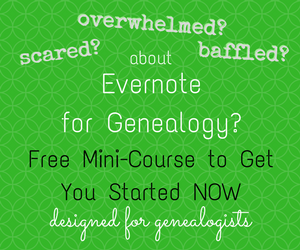 As research for this post, I listened to one of Family Tree Magazine's downloadable webinars. This particular session, Genetic Mismatch: DNA Conflicts in Your Family Tree, was presented by Blaine Bettinger of The Genetic Genealogist and it does cover all three types of tests. The webinar recording is not more in-depth than this post but I highly recommend it as you try and wrap your mind around your options if you think your results are wrong. If you bought some DNA test from some other company, I don't know what's going on. There have been a lot of "snake oil" sales in the last few years where you weren't literally swindled (you did get something) but you may not have actually gotten a DNA test or the quality was questionable or the results useless (a page of numbers---not helpful). This was with small companies who were just out to make a quick buck---not the big name DNA companies. There have also been some legitimate small companies but there are so many, I haven't been able to keep up. Just realize, if you didn't test with one of the big companies, I have no idea what you actually bought so none of this post might be relevant---I don't know. You should research the company you tested with. Many avid genetic genealogists have tried the smaller testing companies if they seemed at all legitimate so an Internet search can turn up information on the good and the bad. What Makes a DNA Test "Wrong?" Before I go on, what actually makes a DNA test "wrong?" First, receiving results that are not yours. This can happen in three ways. You mix your kit up with another kit you had someone else take. The lab mixes up your sample with someone else's. A computer glitch sends you someone else's results. Pretty much everything else is a misunderstanding of what your results are telling you or are due to an error in your ancestry (i.e. either your research is incorrect or something happened that you didn't know about---such as an adoption or an illegitimate birth). Are My DNA Results Wrong? Let's address some quick clues as you determine if your results are wrong or if the issue is something different. Your autosomal test comes with two parts, ethnicity, and your matches. To make it easier to discuss this, I refer to the information provided by matches as "ancestry" although the term could also be used to refer to ethnic origins, that's just not how I'm using it here. I can tell a lot of people claim their results are wrong because of their ethnicity results. I have not heard of someone who had the wrong ethnicity results but received the correct ancestry results. So, if you had other relatives tested, and they match you correctly, your ethnicity results are not wrong. I will discuss this in much great length in a moment. 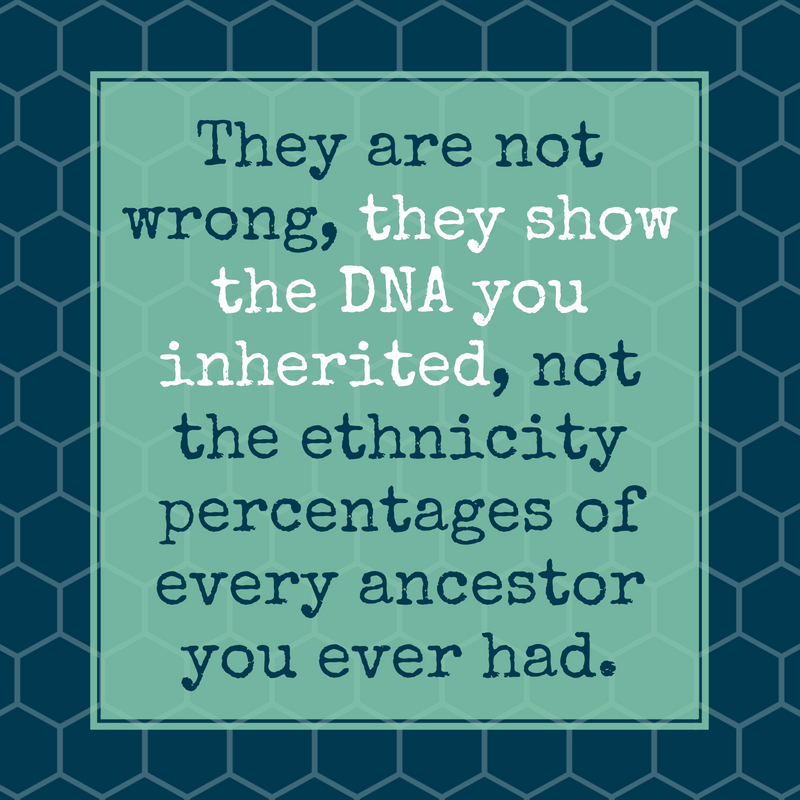 Before I go on to discuss if your matches are wrong or your ethnicity is wrong, there are some basics you HAVE to understand to even do genetic genealogy. If you don't understand these concepts, you probably will think your results are wrong. To do genealogy using DNA, you submit a DNA sample and it is processed in a lab. The lab provides your "raw DNA results." This is NOT what you see when you log into your testing company. You can get this information (and you need it to upload your results to another company or site). If you're curious, you can open up the file. It won't tell you anything. It's raw data, numbers and letters, not sentences (not even words). What does this have to do with your results being wrong? Have you been ignoring that word? It is probably the number one reason people incorrectly claim their DNA results are wrong. You get an ethnicity ESTIMATE and the relationship to your matches is ESTIMATED. So, after you get your results, you are expected to do further work with them. There's not really much you can do with the ethnicity estimate, but you can do a lot of analysis and go from matches with estimated relationships to confirmed shared ancestors for the DNA you did inherit. Doing the analysis with matches is a lot of work. There is no way you can do this work if you have only used AncestryDNA (I don't mean only tested at AncestryDNA, I mean you haven't downloaded your RAW data and worked with it either directly or by uploading it to a different company or site). It is possible only using the other company's displayed results, but it's easier by using tools where you upload RAW data. So where are we with the basics? All the interpretation, analysis, and estimates are places you can misunderstand what the results are telling you withOUT the results being wrong. There are obviously a lot of chances for this. This is why I said at the beginning it was important for you to be willing to consider there was something you don't know. That's actually likely for most people, even those very skilled in genetic genealogy. The biggest difference in a beginner and someone who is good at genetic genealogy is the willingness of the person to accept there is something they don't know, and look for the reason the results appear "wrong." 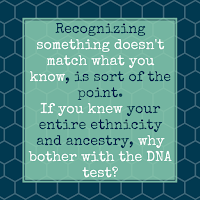 Looking for that reason either increases your skill at genetic genealogy or furthers your traditional genealogy research. You may not find an answer quickly or easily, but you will learn something. Recognizing something doesn't match what you know, is sort of the point. If you knew your entire ethnicity and ancestry, why bother with the DNA test? You're looking for information about what you don't know, right? Investigating the match that doesn't seem to fit is where you'll find a new branch in your family tree. There is one more basic you absolutely must understand. Your autosomal DNA does not represent all the DNA from all your ancestors. It represents the DNA you inherited from some of your ancestors. You can easily think of this like glasses of water. We are all a full glass of water (we have 100% of our own DNA). When you have a child with someone, that child can not hold 200% water---all the DNA from both parents. The way DNA works, the child will have 50% of their DNA from each parent. But don't go applying that backwards. It is like a glass of water in another way. When you pour two glasses of water together, you don't control which parts of the water mix together and are poured into the new glass. Imagine each glass of water was dyed a different color. It would be hard to create the exact same color every time. Each would be slightly different. So think of that going forward (creating new glasses of water). The water from the original glasses keeps reducing, but aside from the exact 50% the first time, the amount can vary as it's passed on. So the third glass created from the second and a new glass (unrelated to the others) will have 50% of its water from the second, but that doesn't guarantee it's an even mix of water from the first two. That happens every generation. The relationship to your matches as provided by the testing company are ESTIMATES and are based on estimates where every generation got an exactly mixed half. That's not how it works in reality, that's why it's an estimate. Plus, after so long, the amounts from older generations are too small to detect. This is particularly noticeable in ethnicity results. I'll go into more detail in a moment but you need to realize, even if you have ancestors of a particular ethnicity, they may not be represented in the DNA you inherited, but they might be represented in your sibling or cousin. This is also true with ancestry but is not as quickly apparent when reviewing your matches. Let's look at ancestry and ethnicity separately. Most often it is not understanding the provided relationships are estimates that cause people to claim their matches are wrong. Let's talk about the more troublesome issue, first, though. 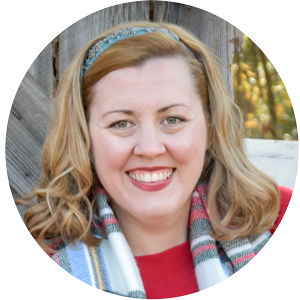 (If you've already realized you were taking the provided relationships too literally, you could go off and simply learn more about genetic genealogy instead of finishing this post---but if you REALLY think they are wrong, this next part is for you). If you have tested close family members or have some other "good" way of determining your matches appear to be wrong, there are two possibilities. There is a "non-paternity event" (NPE for short). It is far more likely a mix up of test kits happened before they were mailed to the lab so carefully consider if there was a chance for this to happen. Even if people were tested at different times, if you had multiple kits in your possession, they can get mixed up. The testing companies want to assign a person to the kit number quickly so sometimes you have assigned a kit number to a relative at purchase or some point before administering the test. If you didn't double check, this could be the problem. My recommendation is if you had multiple kits at any point, see if the results make more sense if you consider they belong to another relative you had tested. If the results don't appear to belong to a relative at all, there could have been a mix-up at the lab (remember, very unlikely) or there could be an NPE. Non-paternity events are basically adoptions or illegitimate births (and in more modern times, sperm/egg donors). You should be prepared for this possibility SOMEWHERE in your tree. Finding them in you or a very close relative is very difficult. The best advice is sadly for before you test. You should realize that DNA testing can always open a can of worms. Be considerate and respectful if there seems to be resistance before the testing. Keep being considerate and respectful after the testing. This is a difficult topic because there are so many variations. There's a difference if the issue appears to be with your paternity, a close relative's paternity, and/or your ancestry (not your paternity but your direct line). I could write some general suggestions but I wouldn't want them misused/misinterpreted for the wrong situation. If you think your "wrong" results could be an NPE, look for qualified help online. I recommend taking a look at DNAadoption.com. They have links to tons of resources and the site is highly respected. Even if your issue is not adoption, they have resources that are related. This post isn't supposed to be a round-up for NPE links so DNAadoption.com is a great starting place you can trust. I've titled this section "historic" but make sure you are considering if your search could affect anyone living. My grandmother was illegitimate (we all knew it so it wasn't a secret, but it wasn't openly talked about). She declared she did not want to be researched (when her teenage granddaughter, that'd be me, started asking about her legitimate family). To me, that was historic (you know how teenagers think, not always sensibly) but it would clearly hurt her so I left it alone. I even tried leaving her father's family alone after she died but I couldn't stand the blank branches in my pedigree chart. This is my family, too. At that point, it had become a "historic" NPE, none of the living family cared if I did the research, they were curious about the results, even. That may NOT be the situation in your family. The children of someone that might be illegitimate might really care. My point? Let's say a "historic" NPE is one where feelings won't be hurt, not one based on time (although I wouldn't be worried about that crazy aunt who can't deal with a 200-year-old adoption, just don't tell her). If your "wrong" results appear to be an NPE and you aren't going to upset your living relatives, you probably do want to take another test. I'd Google for a second opinion on this but I would be tested at a different company. Since a lab problem is rarely the issue, I'd expect the results to be the same---this would get you results at a second company, a good thing. If the results are different, you can still ask the first company for a refund and/or a retest (I have no idea how likely that is, but it's what I'd do). To determine the details of the NPE, you are going to do a lot of additional testing---but of other people. So you do want to be sure your results aren't wrong in this case. If you've been reading all the way through (didn't just skip to this section), I hope you realize your results are most likely your results. There is a variation of NPEs that could be why you think your results are wrong. Perhaps your research isn't correct. It may not be that someone was adopted or someone is illegitimate, you may have just identified the wrong parents somewhere. I don't think this is one of the likely reasons people claim their matches are wrong. Usually, you just have one branch wrong, if any, so you wouldn't think it was all wrong. Understand how the estimates work, look for patterns. Understand you don't have DNA from every ancestor (remember the glasses of water). Estimates are the biggest issue I see people not understanding, and wasting money on a second test (at the same company) just to get the same results. If your matches appear to be yours, but the estimated relationship are all off, be happy if they are at least all off the same way! I've been told in multiple lectures and classes how AncestryDNA relationship estimates are all off. Mine are usually spot on. But I'm 100% southern, which means I'm related to myself too many times (cousin marriages). If my estimates are correct, it makes sense a "normal" person (whose ancestors didn't marry their cousins) would be off. If they are all too close or too distant, just work with it. Unlike your matches, there is no way to tell if your ethnicity estimate is wrong. That means it is EXTREMELY important to understand how ethnicity ESTIMATES work. Remember, these are ESTIMATES. If you've read the sections above, none of this information should be new. The ethnicity revealed by your autosomal DNA test works just like your relatives revealed by your autosomal DNA test. You did not get DNA from every ancestor ever. You also have to remember this applies to each ancestor as well. So, you have 50% from dad and 50% from mom. You don't know if you got exactly 25% from each grandparent or something more like 5%, 45%, 20%, and 30% (you will have 50% from each grandparent couple so it's not going to be 5%, 5%, 5%, and 85%). Why I'm pointing out that this applies to every generation is this... You say "I'm 50% Irish, Dad came from Ireland." But what if 100s of years ago, there was one Scottish, or English, or Welsh, or French, or Scandinavian person that married into the family? Your Dad might have appeared to be 100% Irish (for all intents and purposes, he was). But what if he was actually 1/64 French? You may not know about your French 5th great-grandparent. You probably think this should mean your dad is 1.6% French and you are 0.8% French. What if your mom has French ancestry, though? Suddenly not so straightforward. And let me throw another wrench into this (mathematical) equation. Remember, you don't have all the DNA from all your ancestors. You might have inherited most of the French "ethnicity." The child of the French ancestor (your 5th great grandparent) would have been 50% French. Perhaps his/her child only inherited French ethnicity (not the Irish ethnicity from the other parent) and this happened every generation. It is possible, although unlikely. That means you could show 50% French ethnicity. Your father would also show 50% ethnicity as would each person in the line going back to the original French person. Obviously, this is an extreme example to make the math easier. But it does happen that a large "chunk" of DNA could be passed down with minor recombinations which would skew your results. Your results are not wrong, they show the DNA you inherited, not the ethnicity percentages of every ancestor you ever had. For this same reason, you might show up as 50% French and your sibling 50% Irish (they got none of dad's French ethnicity DNA). So let me recap what we've covered so far about ethnicity estimates. 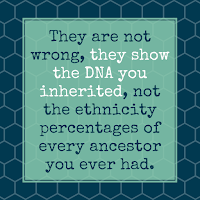 The reality of the random nature of DNA combined with the fact you can't have DNA from every ancestor means you won't have percentages that exactly represent your ethnic heritage. One ancestor who's different ethnicity prevailed during recombination can appear as a huge difference in your results. This can be compounded if that ethnicity is in both sides of your family because it will be added together. There is another factor that relates directly to your perception of ethnicity. That's time. At what point in human history are you considering your ethnicity to be from? So if you didn't have the odd case of ALL of that French ancestry being passed on, if you said "I should be 1/128th French." That would be at the point in time for your 5th great-grandparents. Your French (instead of Irish) 5th great-grandparent probably isn't 100% French and the other great-grandparents probably aren't 100% Irish. They are probably 1/128 of several ethnicities. And of course if several are Scottish or English (or honestly, that far back, what would they be? Celtic, Saxon, ??? ), those would be amalgamated in a statement of "I'm ____% [ethnicity]." If your head is spinning, it gets worse. This is why I don't like using ethnicity estimates except at a very superficial level. If you ethnicity estimate says you're English, what does that mean before the English were English? This starts to get into the real issue with ethnicity (and why they are estimates, it's not just because of recombination). Remember way back at the start of this post I said there was interpretation applied to your raw results? This is even greater interpretation than is applied to your matches. You could say your matches just have statistical interpretation applied. The company uses statistics to estimate the relationship. They give you the simplest to understand estimates (full cousinships). There is no interpretation to what a cousin is. It's a concrete definition. Ethnicity is different. There's the interpretation of what percentage but there's also interpretation of how to define an ethnicity. This is very complex and here's the really important thing to realize...It differs by company. Your ethnicity results should be different from company to company. Each company defines ethnicities differently and uses different sample populations to determine your ethnicity estimate. The estimates are even considered to be at different points in human history (that's part of defining the ethnicities but relates to "what's English before they were English"). So far I've pointed out the issue of recombination skewing your ethnicity (it's not wrong, your autosomal DNA only represents some of your ancestors). I've mentioned having the same ethnicity in different branches makes a difference since you can't tell this from your pie chart. Then there's the fact that humans have to define ethnicity to compare your results to (it isn't a cold hard fact and will differ from company to company). All of this is on top of the fact that the science behind ethnicity estimates is new. The simple science, not the complex interpretation, is fine. The methodology isn't strange, but it's limited and new. When I first learned the types of sample sizes that were used to define some ethnicities, I almost choked. Some were around a dozen people. Do you think a dozen people living today accurately represent any one ethnicity (just one, if your pie chart is broken into multiple parts, you aren't one ethnicity)? But that is also the issue, you are compared to current sample populations. Scientists have to identify a group that isn't extremely mixed to even do this (which is why some sample sizes are so small). I want to point out that not all sample groups are so small. 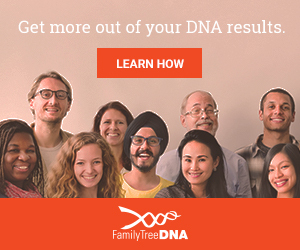 However, I don't consider AncestryDNA's advertisement of how many more ethnicities their test reveals as a good thing (they clearly think it's a selling point as it's the "headline" for some ads). [Since I originally wrote this post, but before I got it published, AncestryDNA released a major update to ethnicity results. I don't even feel the need to update the post based on it. This is a new science that is improving. What I'd hope to see in the (not near) future is ethnicity estimates based on DNA from historic samples, not current populations. That would also relate to time but even if we get to a point before travel was as easy as it is today, that's going to better represent your genealogical ethnicity. That gets more difficult and more expensive. So, your ethnicity estimate is probably not "wrong." Parts of it might be off because of the definition of an ethnicity (this is also why parent-child estimates don't match, just accept they don't, it only indicates the science is new, not the results are wrong). Parts of your estimate may be different for the other reasons I mentioned and therefore are not wrong, they just provide different information than you think they should (Dad may have come from Ireland but that one French ancestor can be over-represented in your results). DNA results are rarely wrong. The #1 reason people claim their results are wrong is not understanding what information they are actually being presented with. Recently it occurred to me that there is a pretty extreme example I could give. I hope it shocks you into wanting to learn more before you loudly (and proudly?) proclaim your DNA results are wrong. Claiming your DNA results are wrong is most often the equivalent of receiving your first mortgage statement and claiming the owed amount is wrong because you didn't realize you were going to be charged interest. Hopefully this analogy makes sense to you. Most people understand a loan (a mortgage to buy a home or refinance a home) is not just money you will pay back dollar for dollar. There will be interest charged. If you divided the cost of the home by the number of payments, it will not equal your first bill. It's far more complex but people at least expect to be charged interest. Saying your DNA results are wrong because your ethnicity isn't 25% for the country each of your grandparents came from is the same (it's far more complex). Claiming your match results are wrong because your great-aunt is listed under "first cousin" is the same (she is correctly listed under the heading for the amount of DNA you share, it's not the heading for the actual relationship and is not supposed to be). The big difference is, most people know to expect interest added to a mortgage. Most people know nothing about genetic genealogy. Hopefully you went over the myriad of mortgage documents when you bought a home. Those explained the various charges and methods of calculation (even if you didn't understand, you probably were then willing to accept that you didn't know everything!). When you take a DNA test, you have similar information made available to you. No one is legally required to go over the DNA information with you so many people assume it's really simple. You can blame the TV commercials but think about all those "easy loan" commercials. They make it seem pretty simple, too. The reason(s) your results are right but appear wrong is due to an error in your expected lineage. This could be an "NPE" such as an adoption or illegitimate birth. It could also be due to an error in your research. These cases are important to deal with delicately. You don't want to upset relatives over an adoption or illegitimacy, especially if it turns out your research is wrong! Finally, it is least likely your results are actually wrong. If you ever had multiple tests in your possession, try and determine if the results make sense if you switch the results. If no other suggestion seems reasonable, mistakes do happen, just rarely. Just like it is your responsibility to understand what is going on when you get a mortgage, it's your responsibility to understand what a DNA test for genealogy will tell you. To make it easier for you, here are the highlights. You will get estimates, estimates, and estimates. You will get information from the sub-set of ancestors you inherited autosomal DNA from, not information from EVERY ancestor you have. The science used for ethnicity is new. Your ethnicity ESTIMATE will change over time. Spitting or swabbing will not give you a family tree. That's up to you. So one last time, your DNA results are unlikely to be wrong. If they are, it's more likely due to a mistake you made (i.e. mixing up kits) than the lab's fault or a computer glitch. If there are ways to test the accuracy, which usually involves other relatives having tested, do that first. ALWAYS remember that DNA testing can open a can of worms. It is best to tread lightly if there seems to be a problem in case the issue is a recent NPE that could end up hurting someone (and that includes you). Once the can of worms is open, it can't be closed. Keep calm and look into the options from most likely to least likely. Remember to be respectful of how other family members may feel. Delving into genetic genealogy can be exciting and fun. It can also turn sour for some people. This is an area where knowledge really is power. Knowing how autosomal DNA works is vital to knowing if your results are correct. Not understanding the basics often means your results appear wrong. Fortunately/Unfortunately, DNA testing is very popular among non-genealogists. That means it is an area where companies can make money and they advertise to do that. Advertisements never want to make something appear hard or complex. Understand what DNA testing can reveal and what its limitations are. Decide what you want to learn from it and develop the skills necessary.